(16/39) TRENTON – As part of its celebration of May as National Historic Preservation Month, the Department of Environmental Protection’s Historic Preservation Office and the New Jersey Historic Sites Council today announced recipients of the 26th Annual Historic Preservation Awards honoring projects, groups or people dedicated to preserving the state’s history. The 2016 honorees include restoration of a Revolutionary War-era mansion used as a headquarters by General George Washington; repurposing of two early 20th century Art Deco buildings in Jersey City into residential housing; expansion of the boundaries of the Waterloo Village Historic District in Warren County; and an educational archaeology program in Mercer County. The awards are presented each year for significant contributions to the advancement of historic preservation, including restorations, rehabilitations, and adaptive use plans for historic buildings and cultural landscapes. 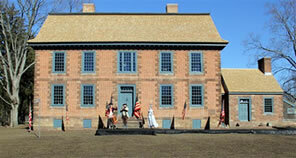 The awards are to be presented today at Morristown National Historical Park. “We are deeply indebted to the work that this year’s award winners have made toward preserving the architectural, cultural and historic resources for all to enjoy,” added Dan Saunders, Administrator and Deputy State Historic Preservation Officer. The Dey mansion, a superb example of Georgian architecture, served as General George Washington’s headquarters in the Preakness Valley. Now owned by the Passaic County Park Commission, the mansion and museum underwent major preservation work, including structural repair, stabilization and replacement of mechanical systems. Interior Historic Structure Report – Clara Barton Museum, Washington, D.C. The Civil War-era rooming house in Washington, D.C., where American Red Cross founder Clara Barton operated her “Missing Soldiers Office, ” has undergone a thorough rehabilitation and restoration planning study to ensure faithful preservation. Barton’s years teaching in Bordentown prior to the Civil War led to her social activism. A three-week archaeological research program/camp in 2015 involved actual excavation field work conducted under professional archaeological supervision. Participants experienced field preparation, excavation, and documentation of exposed remains, as well as analysis of artifacts, and report preparation. The Howell Living History Farm preserves farming as it was done between 1890 and 1910. Illustrating the importance of updating National Register nominations, this expanded nomination for Waterloo Village Historic District now more accurately reflects the true boundaries of the historic district, and the period of historical development, incorporating potential for archaeological resources as well as above-ground resources. Waterloo Village, a State Historic Site, preserves an early 19th century port along the Morris Canal. 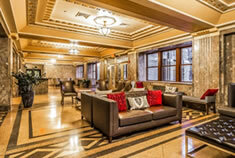 The Margaret Hague Maternity Hospital, built in the Art Deco style representative of the early 20th century and Jersey City Medical Center, itself an architectural landmark, was recently converted to residential use after sitting vacant for decades. MG New York Architects took great care and sensitivity in the design of the conversion to maintain the grandiose feel of the period. Also part of the Jersey City Medical Center complex and built in 1936 as a tuberculosis hospital, the Beacon Criterion was also painstakingly restored to reflect the Art Deco style of the early 20th century and has been repurposed as a successful mixed-use development with multi-family rental units.